OVH have special networking requirement. First you need to login OVH and create vMAC for your IP address. Now create VM in Proxmox, during VM creation, specify this vMAC address under Network > MAC. 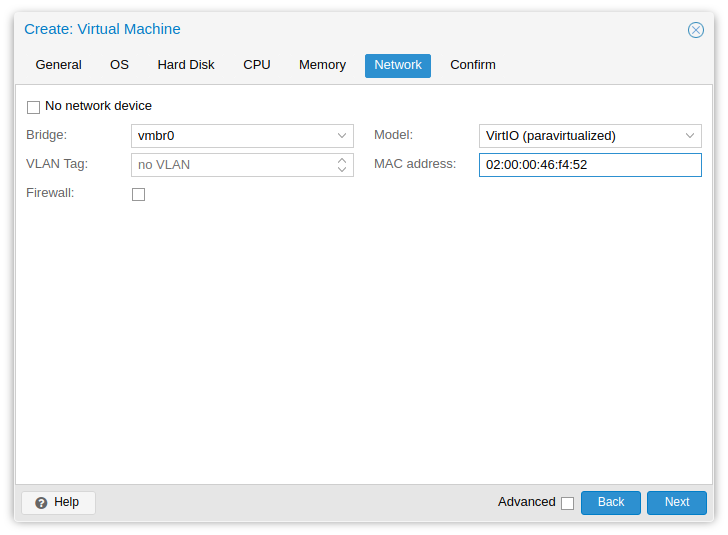 Once your VM is installed, you don’t have network access. Login to the server using Proxmox Console. FAILOVER_IP = IP address of your Virtual Machine. GATEWAY_IP = This is gateway IP addres. This is IP address of your host machine (the server on which proxmox installed). Replace last digit with 254. For example, if your servers main IP is 123.123.123.142, then use 123.123.123.254 as gateway. At this point, you will be able to login to server using SSH. You may not able to ping outside, for this, you need to edit /etc/resolv.conf and add nameserver entry.